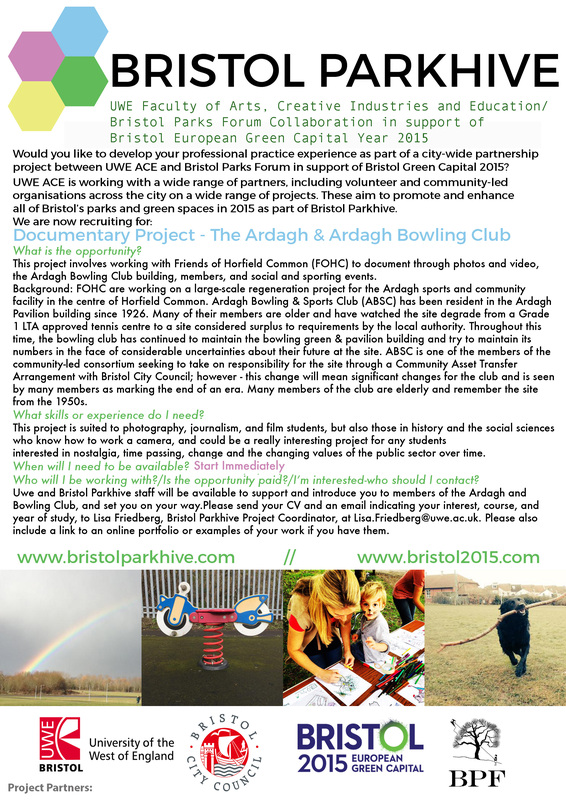 This project involves working with Friends of Horfield Common (FOHC) to document, through photos and video, the Ardagh Bowling Club building, members, and social and sporting events. Background: FOHC are working on a large-scale regeneration project for the Ardagh sports and community facility in the centre of Horfield Common. Ardagh Bowling & Sports Club (ABSC) has been resident in the Ardagh Pavilion building since 1926. Many of their members are older and have watched the site degrade from a Grade 1 LTA approved tennis centre to a site considered surplus to requirements by the local authority. Throughout this time, the bowling club has continued to maintain the bowling green & pavilion building and try to maintain its numbers in the face of considerable uncertainties about their future at the site. ABSC is one of the members of the community-led consortium seeking to take on responsibility for the site through a Community Asset Transfer Arrangement with Bristol City Council; however - this change will mean significant changes for the club and is seen by many members as marking the end of an era. Many members of the club are elderly and remember the site from the 1950s. Suited for: This project is suited to photography, journalism, and film students, but also those in history and the social sciences who know how to work a camera, and could be a really interesting project for any students interested in nostalgia, time passing, change and the changing values of the public sector over time. Please send an email indicating your interest, course, and year of study to Lisa Friedberg, Bristol Parkhive Project Coordinator, at Lisa.Friedberg@uwe.ac.uk. Please also include a link to an online portfolio or examples of your work if you have them.